Trajectories & Impacts, 2012-2017, Sound installation. Since 2008 in Taiwan, I am regularly and often collaborating with dancers.Sometimes I perform live improvisation using recorded sounds and electronic instruments, sometimes I prepare soundtrack for the choreography. But something that I find even more intriguing is the sound recording of body movements in space. 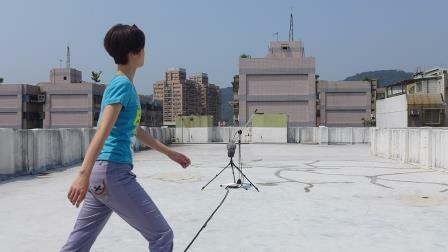 For several projects, such as Danyagu（身體，聲音）with Wu-Kang CHEN (Horse Dance Theatre), or Second Body by Jeff HSIEH (Anarchy Dance Theatre), I had to do some field recording session of dancers improvising in specific locations : basement, rooftop of building, abandonned ruins, natural area etc. Some of these recordings have been done in multi-channel : setting up a complex system of microphones for catching the trajectory of the dancers, his or her footsteps and the acoustic of the space. Some of these materials have never been used, some were part of a larger project. I would like to re-visit these recordings, and prepare a new sound piece, conceived for four-channel sound diffusion. The audience would be invited to enter into a rather dark room (very minimal light), sit on benches or on tatami and listen. Around the audience, four loudspeakers will provide an unusual sensation of acoustic space, the movements of the dancers being audible from distance to close-up. The room will be acoustically improved by setting up recycled wood, long planks (40 cm x 180 cm) leaning against the wall. They will allow to reduce the echoes and reverberation, and bring a special quality of in the old houses. In this room, the audience is invited to a very attentive listening, feeling of the space around.As an introduction to this listening space, in a corridor or a stairwell would be installed another kind of sound installation : I would use special loudspeaker to produce vibration of wooden material. This installation will involve the body of the audience : invited to get close to the material, to touch it, the body will feel more the sound with the skin, with the bones, rather that listening through the ears.